Covered call writing and selling cash-secured puts are considered conservative, low-risk option strategies. Naked option trading is acknowledged to be a more speculative approach to trading options. In the case of covered call writing especially, this is confirmed by the fact that brokerages require a higher level of trading approval for naked option trading than for covered call writing. Moreover, our government permits covered call writing in self-directed IRA accounts but not naked options. This was confirmed by a recent Department of Labor ruling. In this article we will compare covered call writing (selling call options after owning the underlying security) and selling naked call options. Covered call writers look to generate monthly cash flow by leveraging an underlying security that displays outstanding fundamentals, technicals and meets our common sense parameters (like minimum trading volume). The degree to which we are bullish on the stock or exchange-traded fund (ETF) and our overall market assessment will dictate the strike price we select. When a call option is sold without owning the underlying security, the option seller is neutral to bearish on the stock or ETF. It’s like shorting a stock (borrowing the stock from our broker and then selling it with the expectation to buy it back at a lower price). We expect the value of the option to decline so we can buy it back at a lower price or allow it to expire worthless. Although both strategies involve selling call options, covered call writing has a bullish outlook on the underlying while naked call-selling has a bearish perspective where we want the market price to be below the strike of the call we sold, so that it expires worthless. Selling naked calls should be executed when we expect the underlying stock to fall or stay flat. When naked calls are sold we are obligated to selling the stock at the strike price if assigned. Sincethe naked call seller does not own the shares of the stock when assigned, those shares must be purchased at the current market price. This is the reason that brokerages require a margin account for individuals who wish to sell naked calls. It is also the reason that selling calls is considered an options strategy with high risk and requires a high level of trading approval. Stock prices can go up exponentially, and so the risk of a naked call is unlimited. Most of us should avoid naked call selling. The row highlighted in yellow shows an initial 1-month return, of 4.4% with the possibility of an additional 5.1% if share price moves up to the $24.00 strike. Note how an increase in share price results in a positive additional return. In the cells highlighted in brown, we see a Delta of 0.41 and a Gamma of 0.10. If the price of SWHC rises by $2.00, the cost to buy back the option would be about $2.00 based on current Delta and Gamma stats. What if share price moves to $28.00 by expiration? We have generated a 9.5%, 1-month return and can either allow our shares to be sold at the strike or roll the option if appropriate. Uh oh…If assignment is allowed, shares would need to be purchased at $28.00 and sold at $24.00 for a loss of $1200.00 ($4.00 x 300 shares). Since $300.00 was generated initially, that would result in a position loss of $900.00. If we bought back the option to avoid assignment near expiration, the intrinsic value of the $24.00 strike would be $4.00 plus a small time value component, let’s say $0.10. This would compute to a net position loss of $930.00. Naked call selling and covered call writing are both forms of option-selling but they reside in two completely different risk galaxies…one conservative and low-risk; the other radical and high-risk. Of course, along with high-risk comes the possibility of higher returns. It is crucial to align the strategies we embrace with our personal risk tolerances and trading comfort levels. On July 28th at 9 PM ET we will be presenting our first Blue Hour webinar, free to Premium Members. My team is working hard to create a landing page to sign up and the first 50 premium members will have access to the live presentation. This webinar will be recorded and available to all Premium Members on the member page. 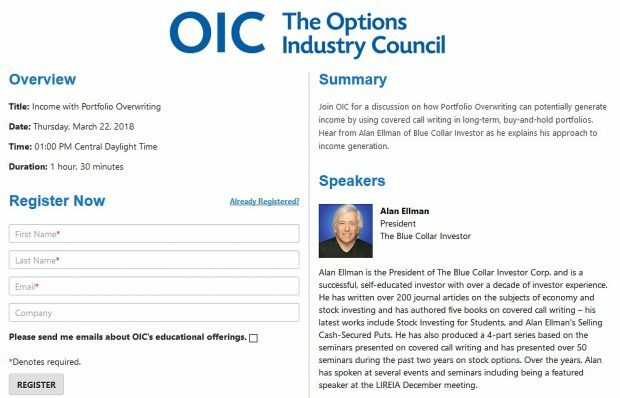 We plan to present at least six presentations per calendar year and they will include live Q&A, expert guest speakers, Barry Bergman, the BCI Director of Research and me. An email will be sent to Premium members once the web pages are ready for registration. There will be no increase in membership fees for existing members who will be grandfathered into the current rates. For the week, the S&P 500 declined by 1.18% for a year-to-date return of +1.35%. BCI: Cautiously bullish but not entering new positions until a market assessment can be made after the Brexit decision later this week. I am 1/3 in cash from exercise of all in-the-money strikes. Without the upcoming Brexit decision, I would have rolled several of those positions. In addition to Brexit, Janet Yellen will be testifying before Congress this week. The charts are demonstrating signs of a neutral short-term outlook. In the past six months the S&P 500 and the VIX have both moved up about 2%, a mixed picture. I held GDXJ over the last contract cycle. Since it performed well I decided to buy the option back instead of being assigned. Since the ETF has a high volatility, would you advize to sell the stock for a more predictable one? My guess is yes. Also, I heard Britain is considering breaking from the EU. Do you think it is still safe to hold ETFs when that decision is announced? Apologies if these are hard questions. GDXJ has been one of the best performing ETFs the past few months and has been at the top or near the top of our Premium ETF Reports during that time frame. On our latest ETF Report on page 1 we see that the security is up 55% over the past 3 months compared to 3% for the S&P 500 (as of this past Wednesday when the report was submitted). However, as you pointed out, on page 7 of that same report we see that GDXJ has an implied volatility of 54.49, more than triple that of the S&P 500. With the upcoming Brexit decision this week, markets are nervous and no one knows what the result will be (not even in Britain) or what the market reaction will be. Experts are all over the map on this one and, in the end, half will be right and half will be wrong. If this was a more long-term concern, I would lean to lower volatile securities but we’ll have an answer this week. I can’t tell you what to do but I’m happy to share with you that I am currently in 1/3 cash and holding off on entering new positions until the vote is taken and market assessment can be made. By the end of the week, things should go back to a more normal level of market challenges. Not that a conservative investor would ever need to look beyond covered calls and cash secured puts to generate income in their self directed IRA’s. But if anyone ever feels that itch I suggest studying up on credit spreads rather than get involved with naked option selling. In a credit spread you generate cash flow without owning the under lying just as in selling a naked option. But since you take some of the proceeds from selling one option to buy another as protection while still generating a credit your margin and risk are greatly reduced. Risk is NEVER eliminated in anything we do in the market unless we buy an insured CD or find a rare arbitrage trade :), It is just reduced. So as always, do your homework first! Spread selling is a fun hobby and strategy in IRA’s for active market followers to make directional income bets with cash risked but not invested. This week’s Weekly Stock Screen and Watch List has been uploaded to The Blue Collar Investor Premium Member site and is available for download in the “Reports” section. Look for the report dated 06/17/16. So are you saying here that for all stocks I had which were ITM at expiry, that I should not have rolled-out any of these but instead let them be assigned, as it’s too risky to keep holding them over these coming Brexit days? Also if within the 1st half of a contract the price of a stock has fallen to a support level, and then news comes out that says that an event (eg. FED raising interest rates) could then severely affect the sector of this stock. A little unsure what to do for these situations if you could tell me. You did nothing wrong by rolling the options. I took a rare extra caution because of Brexit but I’m still heavily positioned in the stock market with shares that were not assigned. I plan to jump back in fully invested after the event with the realization that my caution could actually cost me money if the market reacts favorably to the event. No one knows for sure. In this age of globalization, there will always be an event on the horizon that may impact the stock market. It is also a fact that the stock market historically goes up in value in the long run and currently is the best way to make money especially in this low-interest rate environment. Whether we use these or not we always must be prepared with our exit strategy arsenal which remains consistent in our approach with or without an event like Brexit. In my opinion, leaving money on the table is not so important. On the other hand, losing money hurts terribly, especially if I know before that a big event like Brexit has a 50% chance of sending the stock market sharply down. As Jay said last week, Brexit is very similar to earnings report, and will affect my entire holdings. I prefer to hear that Britain will stay in the EU, because we don’t need a new turmoil in the stock market. Either way, I can get back in after this event is over. Thanks for the kind mention. I got a kick out of this Jim Cramer clip where his facial and body language said he was about sick and tired of Brexit :)! I suspect it would be hard to find a CFA who recommended timing the market. Most say diversify, re-balance and hold a stiff helm into the wind. But there are peevish imps, myself included, who sneak out of school to try and time the market. My favorite method is perhaps the most simple: the 50 day MA on the S&P. It would have been impossible to go broke being long SPY above and long SH below that measure as far back as I can track. And both are optionable for covered calls. I watched the Jim Cramer clip, and I agree with you about his body language. Further, I believe he must have the ultimate cristal ball to be able to single out stocks, and predict what can happen. Let’s wait and see. In 2008 the FED mishandled the Lheman Brothers affair, and the rest is history. Why isn’t NVDA on our Premium Watch List? I had an off-site question about this security which has been on our Stock Lists frequently but not on the most recent list. 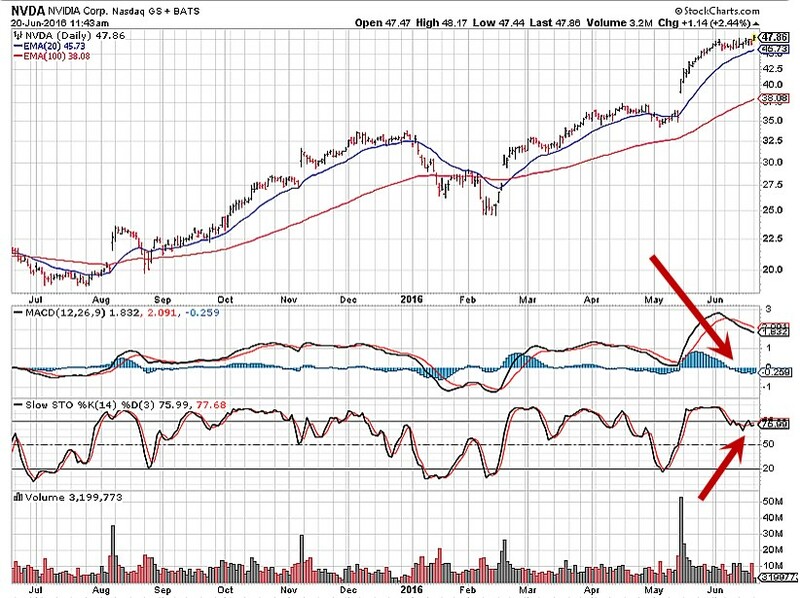 This is a great stock and company that is currently showing some minor technical weakness especially as it relates to our two momentum indicators: MACD Histogram and the Stochastic Oscillator as shown below. Had we already owned this stock in our portfolio and wanted to keep it, I would favor an in-the-money strike. CLICK ON IMAGE TO ENLARGE & USE THE BACK ARROW TO RETURN TO BLOG. My NVDA shares were called away twice in May and June, for a total net gain of 836.00 after comissions. I am really happy with this result. Thanks Alan, I have only rolled out 2 of my 5 stocks/ETF’s, but for the other three I am not going to use for July because of concerning technicals. Something I am trying to work out if you could help me is if I am making the best choices in determining if I should rollout a stock(or even buy stock, and sell call options) to a certain strike price, or to avoid the stock altogether. I will give you some example papertrades to show you what I mean. So for the June contract the Etf’s I held to expiration were:- ILF, XME, and AMJ. ILF = $25C(ITM), AMJ = $32C(ATM), and XME = $24C(ITM). Now for the start of July contracts these 3 ETF’s were OTM, and I closed out ILF and AMJ because of negative chart technicals. So that only leaves XME, with the price at $23.69 on expiry day, yet for this I was only preferably wanting to rollout to sell the July $24C if only the price at expiry was above $24, so that the $24 strike would be called ITM. Instead I had just opted for this ‘$24 OTM-call’, and am wondering if in this type of situation I only want to sell an ITM(as I see mixed technicals), then should I have closed out and sold XME, and not have selected this strike again because it was now OTM? Does this also go for any Stock/Etf I buy and only want a certain strike based on the charts, and if the premium too low for this particular strike then I should just pass on the stock altogether? Hope you can comprehend what I mean above, I know it is quite a learning process to all this so I will post again. This is also an unusual contract month because of the Brexit decision on Thursday. 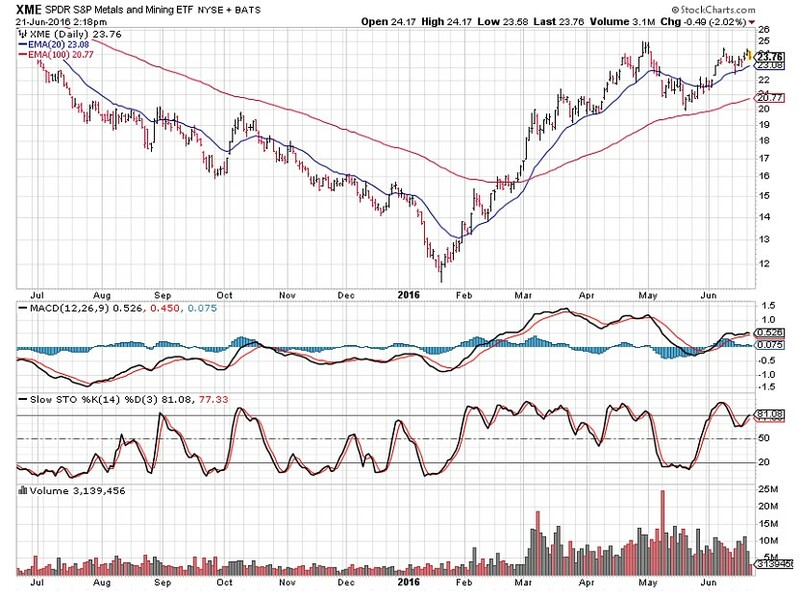 The chart is predominantly bullish as shown below. The consensus for near-term market performance is neutral to slightly bullish looking at the 3 sources in our reports (Admittedly, I’m one of them!). Personal risk tolerance varies and is a personal choice. I am not dodging your question but the answer will not be the same for everyone but I’m happy to share with you that this would be an example of a stock I would leave in my portfolio and write the call after the Brexit decision. I just subscribed and looking at your report I noticed that T has an ER date of 7/21. IBD shows a reporting date of 8/5. Do you know which might be correct. Thanks for your help as I have a 7/22 expiration date. We use earningswhispers.com as our most reliable ER resource although we check other sites when a date seems odd. That site says 7/21. 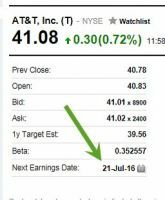 Looking at a free site (finance.yahoo) we find the screenshot below confirming the 7/21 date. If the report is due after the bell, some sites may list as 7/22. I also checked Investools which also has it as 7/21…the consensus is 7/21. This week’s 8-page report of top-performing ETFs and analysis of ALL Select Sector Components has been uploaded to your premium site. The report also lists Top-performing ETFs with Weekly options. Let’s assume “Stay” wins and there is at least one more pop in the morning in our market to celebrate. At the same time the high implied volatility creating the great options premiums for those bold enough to sell lately will be fading fast. My instinct is sell new July contracts on all positions held uncovered for Brexit that you would have otherwise covered on any strength tomorrow morning. Your stocks will likely be higher giving you more flexibility in your choices of ITM, ATM or OTM. Do a mix as Alan does. The direction of this market is far from decided. They helped me to decide to sell my holdings and stay in cash. I will now wait for things to settle down before getting back in. But like so many others I woke up to a surprise this morning! Per the above post I was planning for a “stay” vote. This will create an initial volatility in the stock and currency markets globally as a “stay” vote was priced into the markets. The initial reaction will cause lot’s of “red” today as equities will decline as investors try to analyze the impact this decision will have on corporate earnings. We have to keep in mind that the UK represents 3% of the world economy and so ultimately we should see a stabilization after initial over-reactions. This unexpected event most likely will take a Fed interest rate hike off the table in the near-term until the markets recover. History shows us that when there is an event that shakes the global markets there is short-term volatility followed by recovery and stabilization. For those who sold covered calls, today will most likely represent an opportunity to buy back the options (20%/10%) guidelines) and evaluate next week from there. Stock values depend mainly on corporate earnings and the question we focus on is how much will this event impact those earnings in the long run. History tells us that initial volatility will lead to calming and then business as usual. this event is far reaching and may triger a domino effect in other European countries, shaking the EU profoundly. The global economy has not fully recovered yet from the 2008 crash, and the BREXIT is not what we needed right now.